Screen printing technology has enhanced the way the industry creates screen printed products. 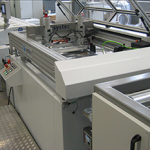 Spartanics-Systec Screen Printing Lines can be configured as cylinder or flat bed systems and enable screen printers to achieve maximum yields. Screen printers can now easily and more efficiently handle and create large format work that is too difficult to attempt with the more generic screen printing presses. Spartanics-Systec Screen Printing Lines are built precisely to specifications to aid your production line to achieve maximum efficiency. The screen printing method can be applied to a variety of materials and substrates. It is a printing technique that applies ink onto another medium by the use of a stencil. The typical screen printing process involves a mesh type of screen, a squeegee and ink. 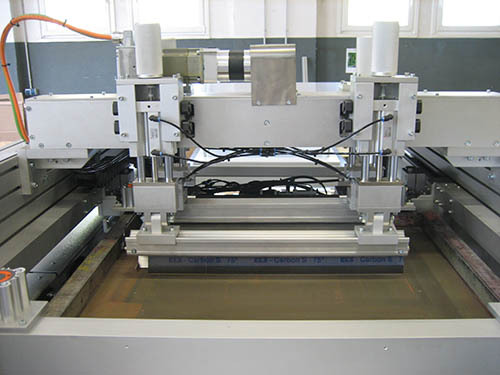 The screen holds the stencil like material that has open and closed areas; the closed areas of the screen blocks the ink and the open areas allow for the ink to flow through. The screen is positioned over the material or substrate that is targeted for the desired print. Ink is then applied to the screen surface and the squeegee motions to move the ink into the open areas of the screen. Depending on your production lines or desired end product, your screen printing system could continue to a type of contact dryer, uv dryer, slitting machine, laminator or another type of finishing option. Spacing between prints can be as little as 1 mm.